Salah Kamal, a 30-year old Syrian refugee, has a love-hate relationship with the public bus of his hometown, Grand Rapids, Mich. When he was resettled in 2016 in Grand Rapids, a mid-size Michigan city, the local bus system was his only connection to food, healthcare, work and important immigration appointments. Though riding the bus made such things possible, Kamal says, it didn’t necessarily make them easy. Now, Kamal works five days a week helping other refugees transition to life in Grand Rapids, including decoding the bus system. Though Kamal bought a car a year and a half after moving to Michigan, most of his clients do not have their own transportation. Kamal uses his own experience to help them learn the confusing world of public transportation in a foreign country. Most Americans are familiar with the frustrations of “the daily commute” – traffic, delayed trains, icy roads, uncomfortable subways – but navigating transportation is a challenging experience for many refugees who don’t have much choice in where they go or how they’re able to get there. The United Nations Refugee Agency (UNHCR) awards refugee status to individuals and families who face violence or persecution in their home country. According to the UNHCR website, once a person or family receives refugee status, a system of international agencies, governments and non-profit organizations coordinate to place refugees and their families in an area where there is available space. Because refugees can’t choose their resettlement location, transportation can present a particular challenge. People living in suburban America often drive their cars to work, while city-dwellers can use public transit to get around with relative ease—but for refugees placed outside urban centers, transportation can limit free time, restrict access to food and social services, and add hours to simple things like daily errands. Salah Kamal fled from Syria to Istanbul in 2013. When he was granted refugee status three years later, he was placed in Grand Rapids. When his plane touched down in June of 2016, Kamal says, his resettlement case worker picked him up and drove him to the hotel where he would stay for three nights. In the darkness, they drove past blurring white and red lights, Kamal’s first images of his new home. Grand Rapids felt so different than Istanbul, he remembers. The streets in Istanbul, a city with more than 10 million residents, are crowded, filled with jostling people, bursts of light, noise, smell. Each city’s transportation system is governed by a unique set of rules and expectations: where to catch a bus, how to pay for it, how to navigate to the correct stop and interact with other passengers. Kamal had used public transportation both at home in Syria and in Turkey, but the world of transportation in Western Michigan was different than anything he’d experienced before. “Back home, in Syria, we were in the middle of a war, but the bus system there was much better than it is here,” Kamal says, “In Istanbul, there’s a subway and taxis everywhere. They’re easy to book. Here, it isn’t so easy.” Though the benefits of urban public transportation did not outweigh the serious threats Kamal faced in Syria, his experience demonstrates how the transition from a big city to a smaller one can present infrastructural challenges for some refugees. For one thing, the bus system in Grand Rapids doesn’t run all night, as micro-buses did when Kamal was living in Damascus. The Grand Rapids bus shuts down from 12:15 a.m. to 5 a.m. As Kamal helps his clients search for work, transportation is a big concern. Kamal helps his clients consider whether a potential job is realistic by figuring out whether it’s on the bus line. If there’s no public transportation, that opportunity gets crossed off the list. Another challenge for many refugees in Grand Rapids is the extended time between many bus arrivals. “All my life, I had heard that one minute is very important in America, and it’s true,” says Kamal of the American standards for timeliness, “but if you miss the bus here, you have to wait 30 minutes for the next bus to arrive.” Though some buses in Grand Rapids have more frequent stops, many of Kamal’s clients work along the bus routes that run less regularly. Stacey Clack, a Michigan mother and founder of a group called “We Love Refugees GR,” describes some of the other transportation difficulties that local refugees face. Many are placed in housing that is far from work, grocery stores, churches and social services. “Imagine having a family with several children,” Clack says. “Then imagine getting groceries for them and riding the bus for nearly an hour to get those groceries. You’re going to need to get groceries every other day, at that rate, and that’s a two-hour round trip.” Add a few trips to the laundromat for that same family, and suddenly, refugees are spending a significant percentage of each day riding back and forth on public transit, she says. Prof. Emily Skop has done research on “non-traditional” refugee resettlement over the past fifty years—the movement away from cities. “When the United States began resettling refugees, most government-sponsored refugees were placed in gateway cities like New York, Chicago, and Miami, traditional immigrant destinations with extensive transit systems and social institutions,” Skop wrote in an article for Papers in Applied Geography. For her study, Skop interviewed 20 new refugees in Colorado Springs, Colo, focusing on challenges that refugees face in non-traditional resettlement destinations, places like Colorado Springs or Grand Rapids that have become more common. 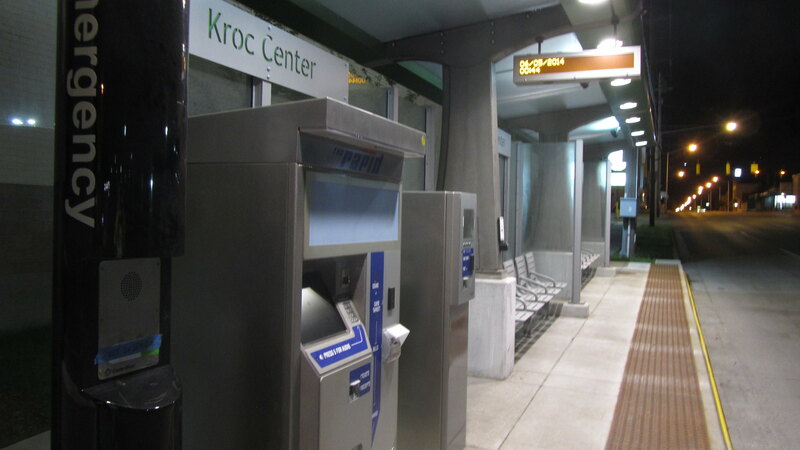 “The key themes that emerged were the various barriers that refugees experienced while accessing public and private transportation… transit time, waiting for the bus, bus availability, navigating the driver’s license process, buying a car, car maintenance, transportation costs, and weather,” Skop wrote. With his car, Salah Kamal says he no longer has to deal with bus frustrations himself, but he will continue to advocate for better transportation access for his clients. NOTE: An earlier version of this article indicated that a volunteer picked Kamal up from the airport, rather than his resettlement case worker. We regret the error.